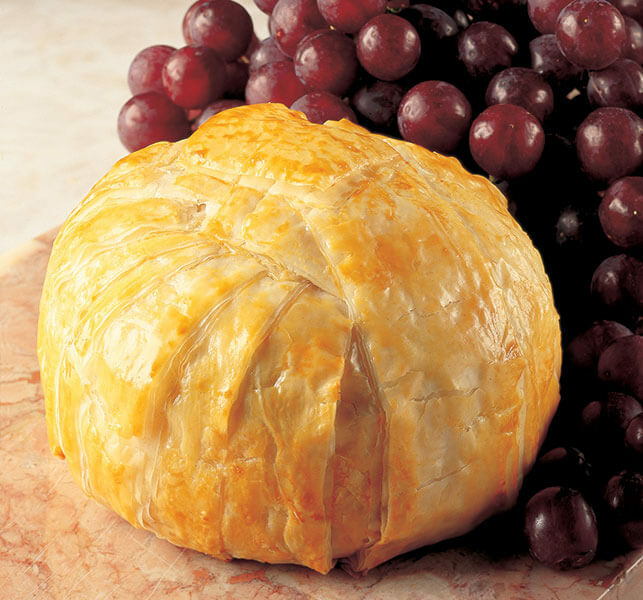 Great for gatherings, this appetizer features crab meat, smoked ham and creamy Brie wrapped in a flaky Phyllo crust. Thaw one roll of phyllo, following thawing instructions on package. Preheat oven to 3751/4F. In a medium bowl, combine crabmeat, ham, scallion, garlic, pepper and salt, mixing lightly. Remove rind from top of Brie and top with crabmeat mixture. Unroll and cover phyllo sheets with plastic wrap and then a slightly damp towel to prevent drying out. Lay a piece of waxed paper on a flat work surface. This will facilitate moving the phyllo. Fold one sheet of phyllo in half lengthwise. Place on waxed paper and dab with butter. Fold a second sheet of phyllo and overlap on first, beginning to create a “spoke wheel” design. Dab with butter and repeat process with remaining sheets. Place brie in the center of phyllo “spoke wheel”. Carefully fold up the phyllo strips over the brie and crab meat. In small bowl, beat egg and water to make egg wash. Brush over Phyllo round. Place on un-greased baking sheet. Bake in preheated 350°F oven for 20 to 25 minutes or until golden brown. Cool 10 minutes prior to serving. Note: For a variation, in place of crabmeat, combine 1/2 cup chopped Prosciutto with 1/2 cup dried cranberries. Place on top of Brie and continue as above. Featuring tuna, mushrooms and vegetables, these flaky and flavorful rolls are sure to please seafood lovers.